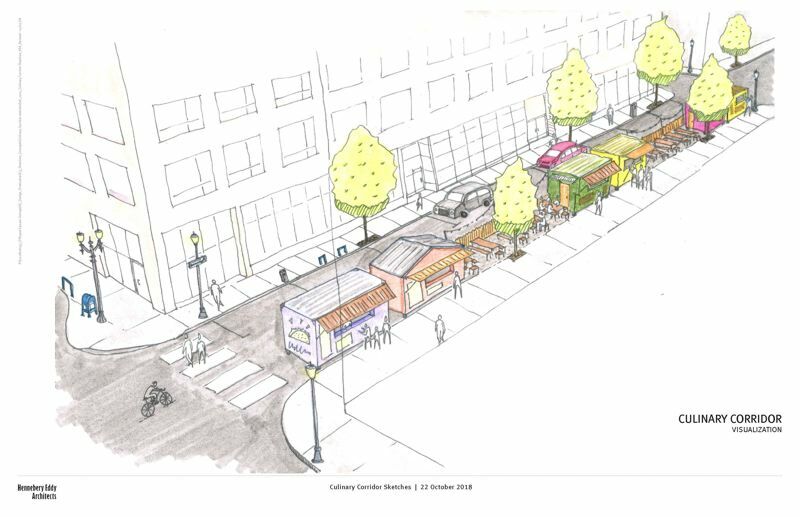 Food carts seen as economic development as a proposed Culinary Corridor would extend along Southwest Ninth Avenue after the Alder Street pod is dispersed by a new tower. The arrival of Portland's fourth tallest building on Block 216 will displace many of the 55 food carts at the Alder Street pod. Those at the adjacent block known as Alder and 10th have already gone, to make way for the Hotel Moxy Portland, which broke ground two weeks ago. 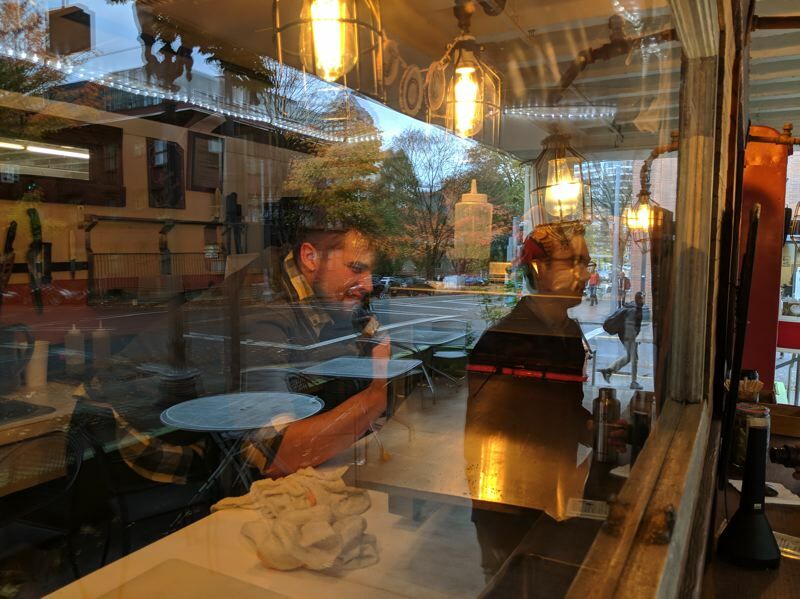 Three men went before Portland City Council on Wednesday, Oct. 31, to make the case for a Culinary Corridor along Southwest Ninth Avenue, from O'Bryant Square to Director Park. 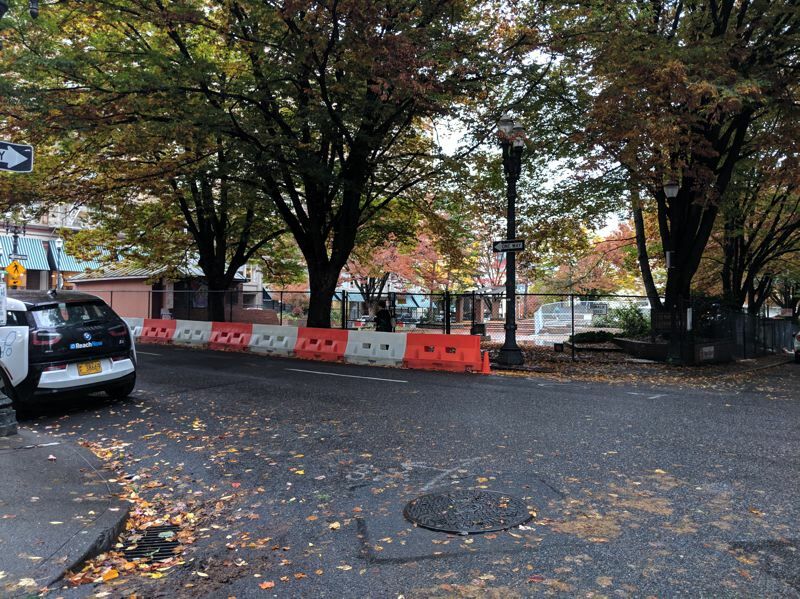 They described this area as a "retail dead zone" and are looking for permission from the Portland Bureau of Transportation to turn many of the parking spaces into to permanent spots for food carts. 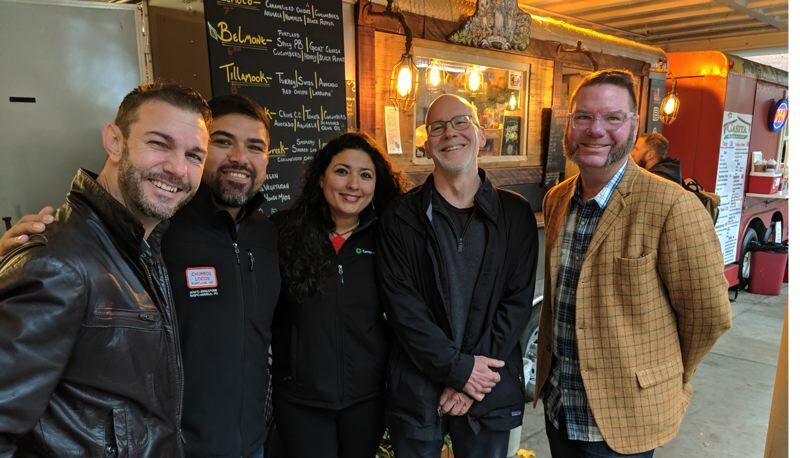 The men — design consultant and author Randy Gragg, food writer Brett Burmeister and food cart owner-operator Daniel Huerta — were there to put the idea on the radar of the city council. Portland native Burmeister talked about tracking the Portland street food industry for 10 years and declared the food cart scene "the envy of the world." He cited Travel Portland as saying food is the number one reason tourists give for visiting Portland. Burmeister gives food tours to tourists and international media. There are 130 food carts in downtown Portland, compared to one McDonald's and no Burger Kings. They are "130 small family businesses and taxpayers," he said, adding that there are around 1,000 food carts and trucks operating in the tri-county area. Daniel Huerta, the owner operator of Churros Locos, said he got into the cart business after losing his job in 2013. 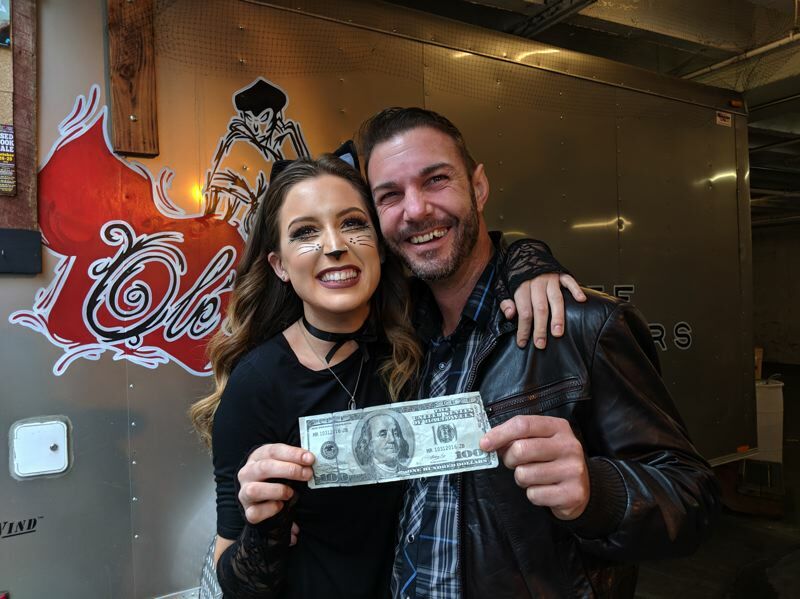 He and his wife Isabel Sanchez started the truck, found a spot in front of Providence Park and won the Timbers fan trade. He since has been to street food conventions in Singapore and the Philippines representing Portland. "Almost everywhere we go when we travel people say, 'Wow, Portland has a great food scene.'" He talked about a Syrian refugee with six carts and a Mexican American Portlander who started selling from the trunk of his car, who has two restaurants and booths at the Portland Airport and the Moda Center. After giving the pro-immigrant, pro-family, pro-bootstraps message, he called on the council members to act now before downtown food carts become "an endangered species." Randy Gragg outlined the physical plan for the culinary corridor. At first it would be a pilot project on one block of Southwest Ninth around O'Bryant Square. If successful it would grow to encompass the five south park blocks ending at Director Park. He noted that in his time writing about architecture for The Oregonian he saw four different plans for the South Park blocks, and attempts to create "festival streets" (usually pedestrian streets devoted to dining and nightlife) but nothing came of them. This corridor might be different because it would harness one of the most creative and dynamic parts of Portland culture, the food scene. "The (food cart) movement was born of the recession, and was the only downtown retail sector that grew during the recession. But food carts also became an important urban regenerator, turning places like O'Bryant Square, AKA Paranoid Park and Needle Park, into a nice place to have lunch. It was absolutely transformative." Gragg said it was natural that multiple surface parking lots — most of which belong to the Goodman family — will be developed, displacing one third of downtown's food carts. The Alder Street pod was the most important because it is near to the retail area called the West End, from Powell's to Union Way and beyond. "We can not only save the food carts, we can grow them." The Culinary Corridor would be tactical urbanism, created by repurposing a few parking spots. "Doing it doesn't have to be difficult. It would connect the West End with Director Park. This is how retail works best in downtown, it connects destinations through lively urban trails, Pearl to Powell's, Travel Portland to the lively cultural district." Travel Portland is soon moving into the glass box in Director Park that used to be Violetta's then the Elephant's Deli annex. He cited the success of the three food carts (which are more gourmet than the ones they replaced) that have been in Pioneer Courthouse Square since it was remodeled as being good for the Square's bottom line, where he is a board member. "(They are) earning a nice rental income that helps our other nonprofit programming." "If it works, the Culinary Corridor can expand; if it doesn't, it can go away. Research is needed. And in the private sector I have talked to a number of people who are willing to step up if the city will step up too, particularly if O'Bryant Square is included. The time to act is now," he said, then issued warning that could only have Portland's elected class quaking in their boots: "Otherwise the national and international headline is going to be 'High-rising Portland loses its street-food soul." Mayor Wheeler appeared interested and asked for a copy of their presentation. Afterward, Gragg said he has been meeting with council members individually, with the Portland Business Alliance, Travel Portland and some of the property owners where the food carts are. "Portland has a very fractured way of conceiving projects, particularly things that are a little out of the box," he told the Business Tribune. "So I thought it would be good to just get it in front of council." Ryan Hashagen from Better Block is interested in helping to execute a pilot. Better Block advocates for street seating and other pedestrian-friendly projects around Portland. Gragg estimates a study of how to set it up would cost $80,000 - $90,000. "There would need to be seating somewhere, which would have to be policed, one has to be very careful with that downtown." They would need other amenities such as trash cans. "The focus now is on getting the green light, the permission. The money would have to be raised and or come from PBOT and hopefully the corridor would be self-maintaining once it was done." "It needs to be designed and thoughtfully done like we did at Pioneer Courthouse Square. There we asked for proposals from the carts and worked with them on the design so they wouldn't clutter up the square. " To get moving, they would need the support of the mayor. "Who would be the landlord is a question. Would a new entity have to be created? Could it be appended onto another entity like a mall management. It could be Friends of the Green Loop. I hope it would happen a lot faster than the Green Loop." Brett Burmeister, the food writer and cart specialist told the Business Tribune that there would be between one and 10 carts in the pilot, and in the full corridor maybe 20. But 130 carts are being displaced by the building of the tower at Block 216. "We don't know where they'll go. Either to the suburbs, or the east side, or they'll just close. And that's the sad reality is a majority of them will close. That's sad for Portland because a majority of these vendors are immigrants, trying to get a leg up in this world. Due to the forces of this city's growth we're just going to say 'Seeya!' And that's a challenge." Both the Moxy developers and the developers of Block 216 have talked about trying to retain the food cart vibe by having a food court in their buildings, but Burmeister is skeptical. Will food courts absorb carts? "The challenge with food halls is you have to be a very experienced restaurateur to manage that and have the capital behind you. Food cart owners aren't sometimes restaurateurs, they have to do things in a small space. So maybe? It depends on how those hotels reach out to the food cart owners and go, 'How would you do it?' And then have them talk with the architect and the construction guy to create those spaces." He cites approvingly the way developer Kevin Cavenaugh has worked with food establishments in his buildings Ocean (Northeast 21st and Glisan) and the Zipper (Northeast 28th and Sandy). Carts just need a kitchen and a serving window. They are managed and permitted differently. The costs are exponentially more expensive in a restaurant. "When you build a cart it's one annual inspection from Multnomah County, just to make sure you're healthy." A vent hood in a cart would cost about $1,400 from an equipment supply store like Rose's. "Whereas if I wanted to put a hood in a restaurant it would cost me about $50,000 dollars in fees. And the hardware on top. System development fees, BDS fees, fees, fees, fees...Electrician fees..." He estimates that building out a sandwich cart might cost $10,000, but to do it inside a food hall or court might cost $80,000. "That's why food carts are so great, it's an inexpensive way to start a business, grow a brand, feed your family. It's a way to start out." Burmeister says if 100 food carts close, part of the food scene would go very corporate. "Cookie cutter things, something you're going to find in Phoenix, or Minneapolis. Why am I coming to Portland if I can go to this restaurant in Phoenix? In 10 years it would be the same feel as downtown Seattle and San Francisco." This cart model is unique to Portland. Other cities have food trucks that vend for a few hours then drive away. Portland has carts there 24/7. "It's better because you know there's going to be 50 micro-restaurants there all the time. Seattle has 4 million people and only 70 food trucks in downtown." He says "Who can afford space in the new tall buildings? The Starbucks, the McDonalds, the Yum! Brands of the world: Popeye, 7-11, Applebees...That's what I don't want to see in my Portland. I'm old Portland." Daniel Huerta runs Churros Locos with his wife, a small cart and a food truck. "Our following is on social media, we do events, we've turned into a catering company on wheels." This includes night markets and weddings. They pay TriMet to vend outside Providence Park games by the MAX train. "We're doing this for the stationary carts," Huerta told the Business Tribune. "We don't want to lose what Portland is known for. As a business owner it wouldn't affect us right now. This is mostly for the culture of Portland....There's so much diversity here now and that's being threatened by the development." They have talked to people in Seattle, San Francisco and New York. "They really like the food cart model because they don't move. One of the number one things that comes up, they're unique." Any help they would get would be local. They're looking at Seattle's laws that say they can park on the public right of way and vend for a few hours, and seeing how that could be adapted. He readily admits Brett Hameister is the best-connected of the three, who can talk to the PBOT director, the mayor, and others. "I felt like they were willing to listen to us today."